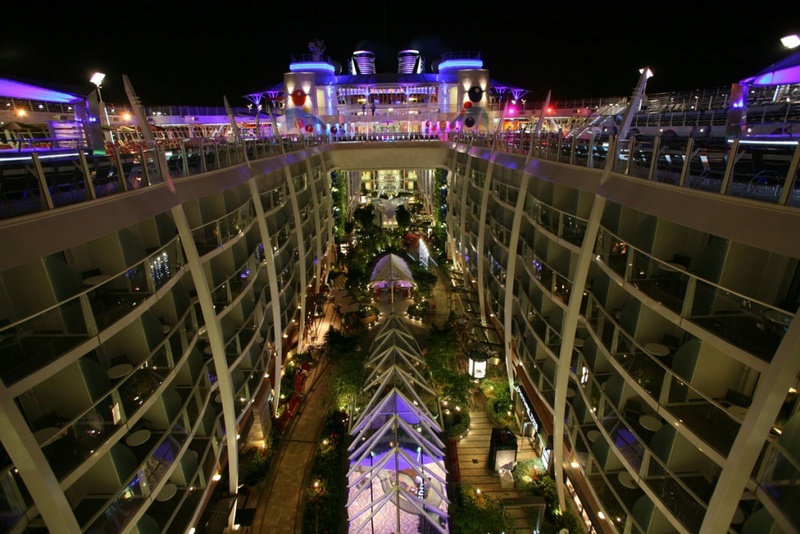 Oasis of the Seas is the ship that heralded the new era of mega cruise ships. Launched in 2009, Oasis is as big as a high-rise apartment building, standing 16 decks high and 361 metres long. 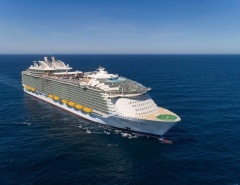 After less than a decade in service, Oasis of the Seas has already undergone several cosmetic refits to keep it relevant with today’s cruisers. On the whole, Oasis has been warmly embraced by passengers eager to enjoy the full Royal Caribbean experience. 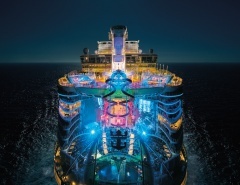 Although huge, the ship’s features are easily accessed thanks to the ‘neighbourhood’ concept introduced by Royal Caribbean. The vessel is divided into distinct areas for dining, relaxation, shopping, swimming and appreciating all that Oasis has to offer. The neighbourhoods encourage passengers to roam and mingle without crowds causing bottleneck ‘people-jams’ at the various attractions. With more than 7,500 people onboard including passengers and crew, the ship needs to function seamlessly. Central Park: restaurants, bars and exclusive shops surround a real park with 56 established trees and 12,000 plants in total. This village green is a great place to kick back and relax. Boardwalk: The ornately crafted carousel is a unique cruise ship feature designed to surprise and delight. The AquaTheatre includes a huge freshwater pool and seating for 750 people to enjoy the show. Restaurants, bars and two rock-climbing walls are diversions worth experiencing. The Pool and Sports Zone: Two surf simulators provide an opportunity to cut some radical moves, while the gentle sloped beach pool is an alternative means to enter the water and cool down. 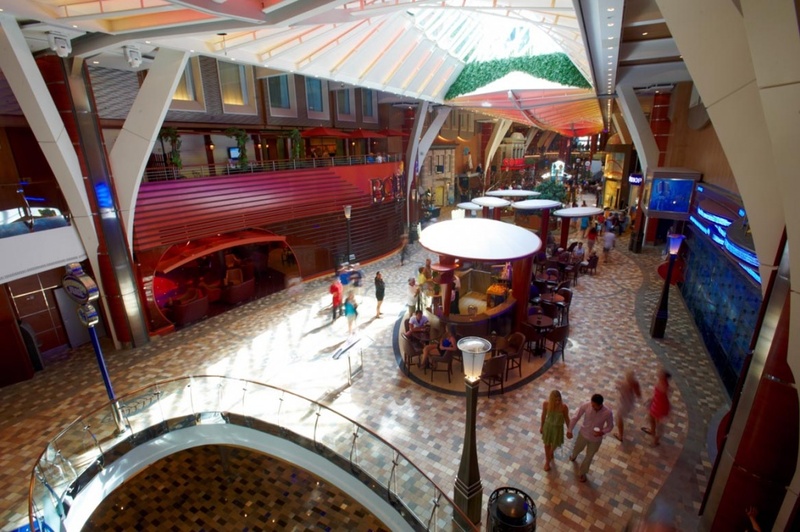 Royal Promenade: An area for shopping, eating, people-watching or simply appreciating the majesty of the ship. Entertainment Place: This area is fun by day and a blast at night, housing an ice skating rink, the main theatre, a casino, a nightclub and smaller establishments for enjoying a drink or music of your choice. Vitality at Sea Spa and Fitness Centre: Working off the calories and keeping toned is easy on Oasis. There are almost 160 exercise and cardio machines plus spa pampering services, fitness classes and even a separate spa for teenagers. Youth Zone: Kids of today are tech crazy and Oasis of the Seas provides computer games and even a science lab for budding professors. Activities and entertainment choices are outrageously diverse and there is absolutely no excuse for not having a good time. Even seasickness is kept at bay on Oasis, as the sheer size of the vessel means the movement of waves is hardly noticeable. The theme park style strategy seems to be working, and Oasis regularly sails at full capacity. Approximately 30 percent of passengers enjoy it so much they don’t even leave the ship during port stopovers. The resemblance to an apartment building or on-land shopping complex continues once passengers enter the Royal Promenade where shops such as Michael Kors and Starbucks are a mirror image of their on-land counterparts. 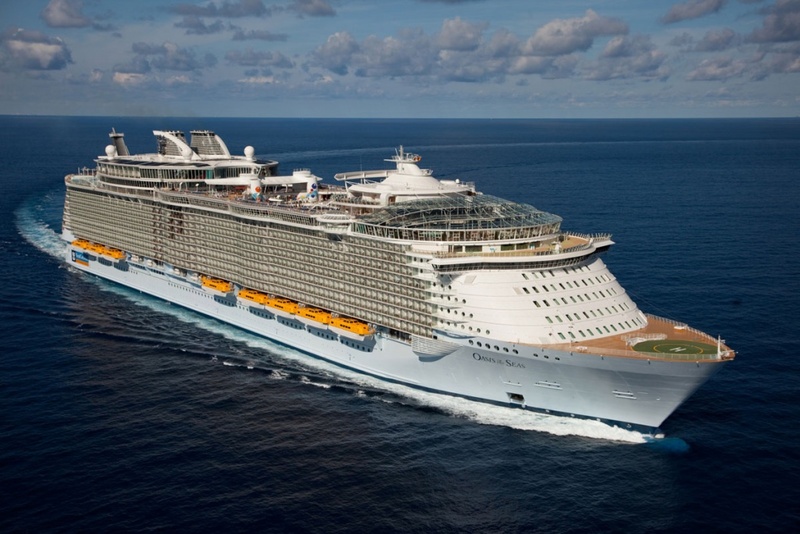 The magnitude of Oasis of the Seas could have resulted in a lumbering impersonal hulk of a vessel. Fortunately, the space provided opportunities as well as challenges and the design team were up to the task. For example, the Central Park neighbourhood garden is an at-sea first and includes areas that open to the sky. Central Park and other neighbourhoods are great for meeting people and just watching the world float by. 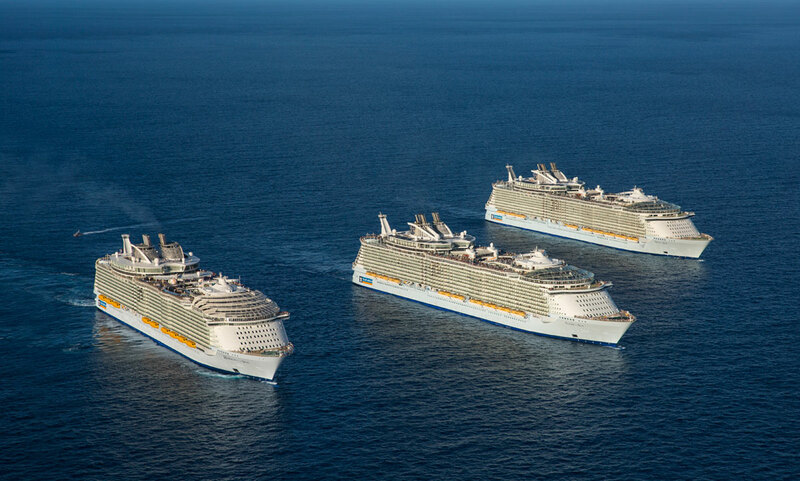 Enormous Royal Caribbean mega ships really are floating theme parks and have been designed accordingly. Cruising has changed during the past few decades and Oasis attempts to keep the entire passenger demographic satisfied. Activities and attractions are non-stop and all around the ship but so is the opportunity to escape to adults-only sanctuaries or to enjoy the formal cruise style of yesteryear. 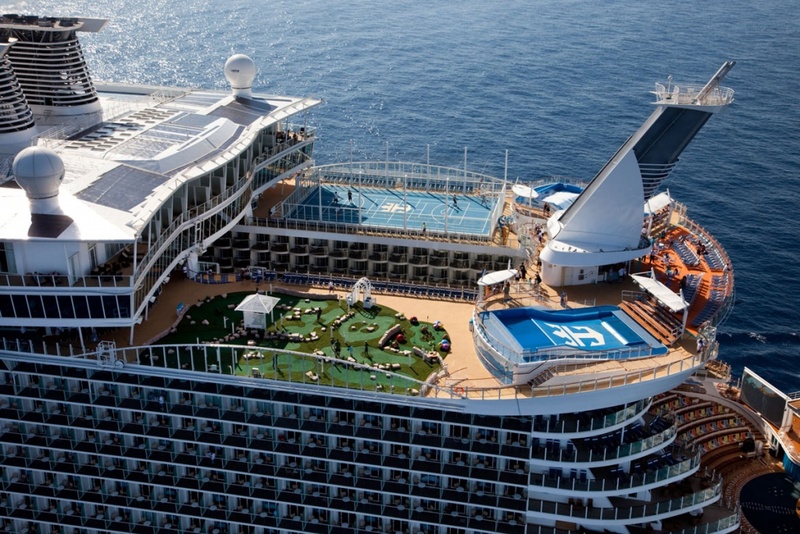 Enormous cruise ships have the capacity to offer a huge range of cabin choices. 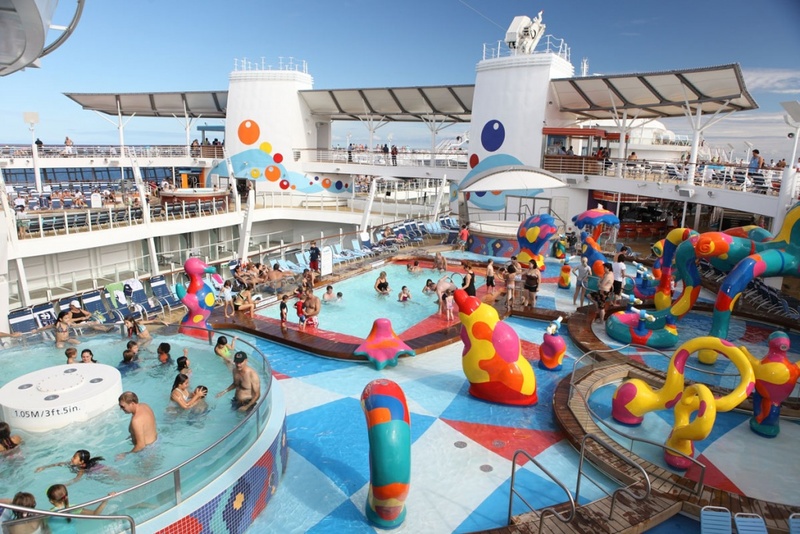 People of all ages are joining the cruise revolution and cabins have evolved to meet demand. Whether you are a solo traveller or a member of a sports or social team, Oasis of the Seas has accommodation that will fit the bill. Some cabins can be reconfigured to link with adjoining cabins; great for larger families who need to stick together yet have room to breathe. Additional decisions include the choice between balcony and oceanview cabins or an indoor cabin overlooking Central Park or the Promenade. Some passengers splurge on the cabin and stick to free entertainments while others prefer simple accommodations and additional spending money. 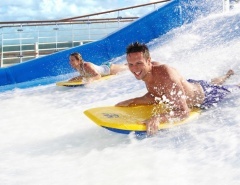 Oasis of the Seas can accommodate any budget and cruise prices are extremely competitive. Interior: These smaller cabins are slightly larger than the cruise ship average and accommodate one or two people nicely thanks to inventive storage solutions. Some interior cabins come with bay windows overlooking the Promenade. Oceanview: These are great for people who want to appreciate the outside world while remaining within the ship’s confines. There are also Boardwalk-view cabins on Deck 7. 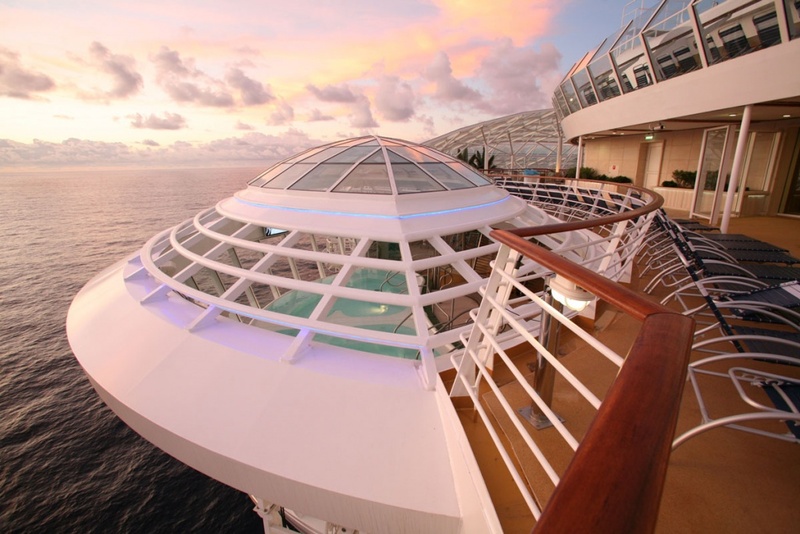 Balcony: Options abound, with ocean view, Central Park and Boardwalk balcony cabins to suit all mega ship cruise styles. Mini-Suite: The difference between mini-suites and regular cabins is the extra space for a table and comfy sofa. Mini-Suite bathrooms include a tub as an additional incentive. They also have moderate sized balconies. Some suites can be configured so you remain family-connected. Suite: Passengers in suites enjoy a number of perks including access to the Coastal Kitchen and Suite Lounge. Free drinks are also offered during cocktail hour from 5 until 8:30 pm. Additional incentives include reserved theatre seating, priority check-in, special menus and in-cabin dining plus luxury bathrobes. Sky Class suite categories include AquaTheatre suites, Crown Loft suites, Owner’s suites, Royal Family suites and Grand suites, all with personalised appeal. Family: Family Suites can sleep up to six people and come with a balcony. The sofa and beds convert from twins to queen size, plus a couple of bunk beds are made private with a dividing curtain. Royal Family Suites are even larger and can accommodate up to eight people. 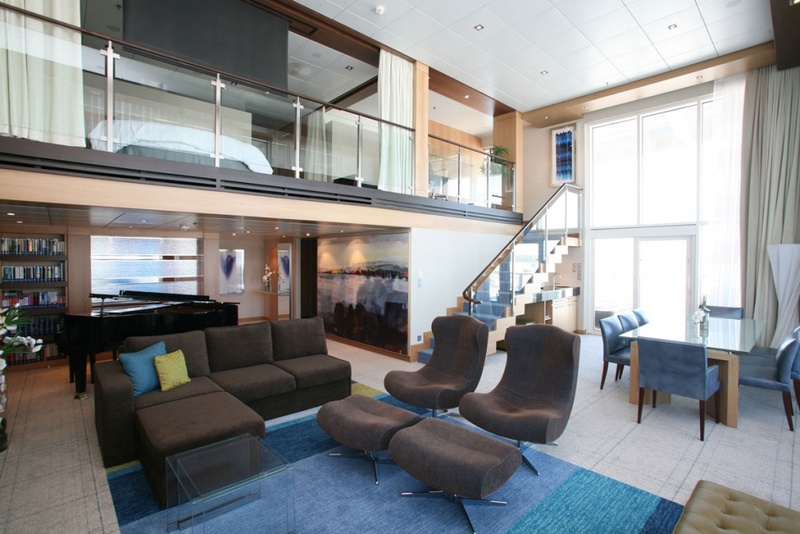 Those who want a truly Royal Caribbean experience can opt for huge Loft Suites, Owners Suites and the Royal Loft Suite with an enormous balcony and all the comforts of a luxury home including a baby grand piano and dry bar. There are 25 dining and eating options on Oasis of the Seas. One of the first considerations is to understand complimentary and for-fee options. Restaurant reservations can be made prior to boarding or once onboard to avoid queuing and waiting for a meal. Free eating options are great for families and those on a budget, but it’s well worth keeping a little money aside for enjoying meals in restaurants overseen by some of the world’s greatest master chefs. Wayfinder boards strategically placed around the vessel inform passengers if restaurants are getting crowded. The main restaurant is actually spread over three areas of the ship to allay overcrowding and encourage movement between venues. American Icon Grill: Open for breakfast, lunch and dinner, this popular establishment features My Time Dining and a Brasserie 30 lunch during sea days. A huge range of culinary styles makes the American Icon Grill and main dining counterparts Grande on Deck 4 and Silk on Deck 5 extremely popular, especially with large groups on a budget. Grande and Silk both offer set-seating options for the traditional cruise dining experience. Coastal Kitchen: This attractive and plush restaurant offers free dining for suite passengers. It is airy, uncrowded and provides fabulous views. Menu selections are a cut above the main restaurant dining options and once you have experienced the Coastal Kitchen it’s hard to go back. European and American flavours are the Coastal Kitchen style, with quality that has to be tasted to be believed. Windjammer Marketplace: This is one area where designers of Oasis slightly underestimated a venue’s popularity. Open for breakfast, lunch and dinner, this top deck buffet services those who don’t need time out for a formal meal. It’s great for kids and families who prefer to remain in swimwear and soak up the sun. Everything from healthy salads to hearty burgers are provided at Windjammer. Wipe Out Cafe: Appropriately named and located next to the FlowRider, this cafe is a quick meal alternative serving hot dogs, fries, burgers, snacks and ice cream. Park Cafe: A very popular place for those who enjoy a fresh salad or healthy sandwich. Sorrento’s Cafe: Serving an ever-changing variety of pizza slices on a daily basis, with the option to design your own toppings. Boardwalk Dog House: This establishment will change the outlook of cruisers unfamiliar with the American fascination with hot dogs. Many styles and condiments are available. Room Service: The perfect option for times when you just want to stay inside, put your feet up and enjoy yourself home-delivery style. The paid dining options on Oasis of the Seas take things to the next level. From Starbucks coffee and Ben & Jerry’s ice cream to Asian, Mediterranean and American flavours, the culinary choices are vast. It’s easy to enjoy a different meal for every breakfast, lunch and dinner on Oasis of the Seas. Highlights include Sabor (Mexican), Chops Grille (steakhouse), Izumi (sushi) and Giovanni’s Table (Italian). Whether you are looking for action or relaxation, Oasis of the Seas is full of temptations. Adrenaline junkies head for the surf simulators, rock-climbing walls, zip line, ice skating rink or basketball court, with a little down time playing mini-golf. Relaxation is meant to be easy and Oasis is a guilt-free getaway for pampering and health. The thermal suite treatment range is extensive and the adults-only solarium provides an escape to paradise. There are 10 whirlpools on Oasis plus the Fitness Centre offering yoga and tai chi classes. Kids and families love the DreamWorks Experience that includes famous characters such as Kung Fu Panda. The Adventure Ocean Youth Program is complimentary and there is even a teen lounge and disco. Babies and toddlers are welcome also, with a nursery and activities program fully supervised and lots of fun. The H2O water park and 3D movie theatre are also very popular with youngsters. Entertainment includes Vegas-style shows in the theatre, AquaTheatre shows, live entertainment, bars and clubs, plus a nightclub for dancing till late. Karaoke, comedy and Jazz all live in harmony on Oasis of the Seas. Reservation-only celebrations include the Prohibition Party and Surf’s Up Party for passengers to mix and mingle with their own crowd. Shopping is outstanding on Oasis, with name-brand apparel, perfumes and jewellery available, plus cruising essentials such as swimwear and sun-hats. 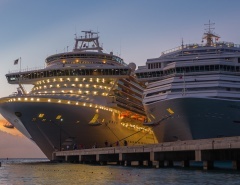 Royal Caribbean ships are well known and welcomed to the Caribbean thanks to cruise ethics that demand sustainability and energy efficiency. Royal Caribbean even has private island resorts that are only accessed by their vessels. Seven night cruises to the Eastern and Western Caribbean are the duration of choice for most people, providing plenty of time to experience beautiful destinations and experience all that Oasis has to offer. Destinations include Labadee (Haiti), Falmouth (Jamaica), Cozumel (Mexico), Philipsburg (St Maarten) and San Juan (Puerto Rico). The Caribbean and South American coast is like nowhere else on Earth, welcoming passengers with clear tropical waters, pristine beaches, bustling markets, historical monuments and laid back people. Seeing really is believing. For the latest version of the deck plans, please visit the official website.